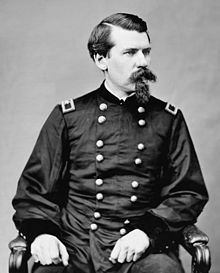 Horace Porter (April 15, 1837 – May 29, 1921) was an American soldier and diplomat who served as a lieutenant colonel, ordnance officer and staff officer in the Union Army during the American Civil War, personal secretary to General and President Ulysses S. Grant. He also was secretary to General William T. Sherman, vice president of the Pullman Palace Car Company and U.S. Ambassador to France from 1897 to 1905. Porter was born in Huntingdon, Pennsylvania, on April 15, 1837, the son of David Rittenhouse Porter (1788–1867), an ironmaster who later served as Governor of Pennsylvania, and Josephine McDermott. His paternal grandfather was Andrew Porter, the Revolutionary War officer and his paternal uncles included George Bryan Porter, the Territorial Governor of Michigan, and James Madison Porter, the Secretary of War. Among his first cousins was Andrew Porter, was a Mexican–American War veteran and Union Army brigadier general. His aunt, Elizabeth Porter, was the grandmother of Mary Todd Lincoln. Porter was educated at The Lawrenceville School in Lawrenceville, New Jersey (class of 1856) and Harvard University. He graduated from West Point July 1, 1860. Porter was commissioned a second lieutenant on April 22, 1861 and a first lieutenant on June 7, 1861. During the American Civil War, Porter served in the Union Army, reaching the grade of lieutenant colonel by the end of the war. During the war, he served as Chief of Ordnance in the Army of the Potomac, Department of the Ohio and the Army of the Cumberland. He was distinguished in the Battle of Fort Pulaski, Georgia, at the Battle of Chickamauga, the Battle of the Wilderness and the Second Battle of Ream's Station (New Market Heights). On June 26, 1902 or July 8, 1902, Porter received the Medal of Honor for the Battle of Chickamauga as detailed in the citation noted below. In the last year of the war, he served on the staff of Gen. Ulysses S. Grant, later writing a lively memoir of the experience, Campaigning With Grant (1897). From April 4, 1864 to July 25, 1866, Porter was aide-de-camp to General Ulysses S. Grant with the grade of lieutenant colonel in the regular army. On July 17, 1866, President Andrew Johnson nominated Porter for appointment as brevet brigadier general, to rank from March 13, 1866, and the U.S. Senate confirmed the appointment on July 23, 1866. From July 25, 1866 to March 4, 1869, Porter was aide-de-camp to General Ulysses S. Grant with the grade of colonel in the regular army. Pullman's Palace Car Co. stock certificate signed by Porter in 1884. From 1869 to 1872, Porter served as President Grant's personal secretary in the White House. At the same time, he held the grade of colonel and an appointment as aide-de-camp to General William T. Sherman. After resigning from the Army, Porter became vice president of the Pullman Palace Car Company, and later, president of the West Shore Railroad. He was U.S. Ambassador to France from 1897 to 1905, paying for the recovery of the body of John Paul Jones and sending it to the United States for re-burial. He received the Grand Cross of the Legion of Honor from the French government in 1904. In addition to Campaigning with Grant, he also wrote West Point Life (1866). Porter was president of the Union League Club of New York from 1893 to 1897. In that capacity, he was a major force in the construction of Grant's Tomb. He was elected an honorary member of the Pennsylvania Society of the Cincinnati in 1902. He was also a member of the Military Order of the Loyal Legion of the United States, the Sons of the American Revolution and a Hereditary Companion of the Military Order of Foreign Wars by right of his descent from Lieutenant Colonel Andrew Porter who served in the American Revolution. In 1891 he joined the New York Society of the Sons of the American Revolution, where he served as President General from 1892 through 1896. He was assigned national membership number 4069 and state membership number 69. He died in Manhattan, New York and is interred at the Old First Methodist Church Cemetery in West Long Branch, New Jersey. Horace Porter Jr., who died at the age of 23 of typhoid fever. Clarence Porter, who died after the first World War. Elsie Porter, who married Edwin Mende of Berne, Switzerland. William Porter, who died in infancy. After a period of suffering, Porter died at New York, New York, May 29, 1921. He was buried in West Long Branch Cemetery, West Long Branch, New Jersey. In his will, he left the Grant Association $10,000 and the flag that flew at General Grant's field headquarters during the Civil War. Captain, Ordnance Department, U.S. Army. Place and date: At Chickamauga, Ga., September 20, 1863. Entered service at: Harrisburgh, Pa. Born: April 15, 1837, Huntington, Pa. Date of issue: July 8, 1902. While acting as a volunteer aide, at a critical moment when the lines were broken, rallied enough fugitives to hold the ground under heavy fire long enough to effect the escape of wagon trains and batteries. ^ a b c d e "HORACE PORTER". The New York Times. 30 May 1921. Retrieved 23 August 2017. ^ Evans, W. A. (2010). Mrs. Abraham Lincoln: A Study of Her Personality and Her Influence on Lincoln. SIU Press. ISBN 9780809385607. Retrieved 23 August 2017. ^ Eicher, 2001, p. 435 identifies this as the Lawrence Scientific School. ^ "GEN. PORTER RECALLS SCHOOL DAYS OF '54; Lawrenceville Alumni Honor Him at Waldorf Banquet. BIG CHANGE IN FIFTY YEARS No Broken Heads Then in Football and Baseball Was "Towball" -- Woodrow Wilson on Athletics". The New York Times. 25 March 1906. Retrieved 23 August 2017. ^ a b c "McHarg Family Papers: Part 2". findingaids.library.georgetown.edu. Georgetown University Archival Resources | Georgetown University Manuscripts. Retrieved 23 August 2017. ^ Jean Edward Smith, Grant, pp. 481-490, Simon & Schuster, 2001. ^ "Presidents General of the SAR and Annual Congress Sites". Sons of the American Revolution website. 2014-03-18. Retrieved 2015-02-19. ^ "Horace Porter". www.findagrave.com. Retrieved 9 March 2019. ^ "MRS, HORACE PORTER DEAD; Wife of American Ambassador to France Expires Suddenly. A Chill Develops Into Congestion of the Lungs--Gen. Porter Prostrated--American Colony in Paris Shocked". The New York Times. 7 April 1903. Retrieved 23 August 2017. ^ a b "GEN. HORACE PORTER NEAR DEATH AT HOME; Ex-Ambassador to France, 84 Years Old, Is Suffering From a General Breakdown". The New York Times. 27 May 1921. Retrieved 23 August 2017. ^ "NOTED MEN AT BIER OF GENERAL PORTER; Hear 'Taps' Soundsd Over Veteran at Simple Services in 5thAv. Presbyterian Church.DEEDS PRAISED IN PRAYER Rev. Dr. John Kelman Gives Thanksfor "One of the Great Gentlemen of the Olden Days."". The New York Times. 3 June 1921. Retrieved 23 August 2017. ^ "MANY PORTER HEIRS GET LARGE ESTATE; Battle Flag of Grant, Now in Tomb, Left to Upkeep Association With $10,000 Bequest". The New York Times. 10 June 1921. Retrieved 23 August 2017. ^ "PORTER, HORACE, Civil War Medal of Honor recipient". American Civil War website. 2007-11-08. Retrieved 2007-11-08. McFeely, William S. Grant: A Biography (1981). "Civil War Medal of Honor recipients (M-Z)". Medal of Honor citations. United States Army Center of Military History. August 3, 2009. Archived from the original on February 23, 2009. Retrieved July 1, 2010. "Horace Porter". Claim to Fame: Medal of Honor recipients. Find a Grave. Retrieved 2007-11-08. Wikimedia Commons has media related to Horace Porter. Modern Eloquence: Vol III, After-Dinner Speeches P-Z at Project Gutenberg, contains a number of speeches by Porter. Mende, Elsie Porter; Henry Greenleaf Pearson (1927). An American Soldier and Diplomat, Horace Porter. Frederick A. Stokes Company. Owens, Richard Henry (2002). Biography of General and Ambassador Horace Porter, 1837-1921: Vigilance and Virtue. Lewiston, New York: Edwin Mellen Press. ISBN 0-7734-7242-8. This page was last edited on 11 March 2019, at 09:18 (UTC).